It is Memorial Day Weekend here in the US. Memorial Day is the day we remember and honor our fallen war heroes. I personally don’t know anyone who has died while in service to our country, but am exceedingly grateful for those who are willing to put themselves in harm’s way. That’s a lot to ask of anyone. And though we may not be a perfect country, we certainly have far more freedoms than many others. Memorial Day also marks the unofficial beginning of summer with an extra day off from work or school. So in recognition of a little extra free time and in anticipation of warmer weather, I made a new pattern from McCall’s: 6961. Pattern Description: Misses’ Tops, Belt, and Tunic. 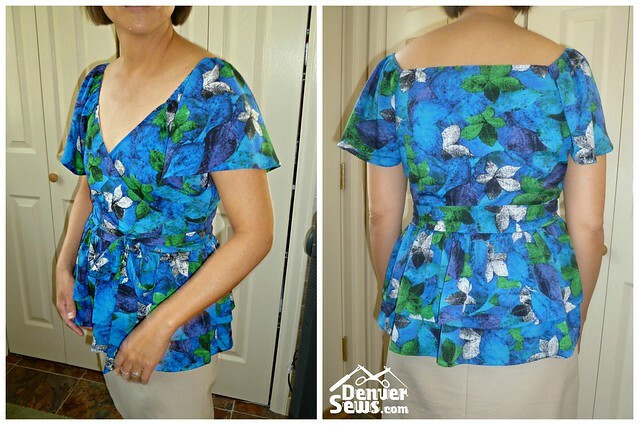 Close-fitting mock wrap tops and tunic have bias upper front, lined upper sections, gathered lower section variations, side zipper and narrow hem. I made view B. Pattern Sizing: Using my measurements, I cut a size 14. I also did a small bust adjustment, essentially eliminating the dart. My typical small bust adjustment requires removing 1″ in both the shoulder-to-waist direction and the center-line to side-seam direction. Did it look like the photo/drawing on the pattern envelope once you were done sewing with it? I say “no”. The model on the envelope must have been wearing the smallest size possible, because the bodice looks taller than it is wide. And it definitely does not look that way on me. Were the instructions easy to follow? The instructions are fairly easy to follow. The part I had issue with was putting together the right side seam (the one without the zipper). I’m not really sure what they were trying to get me to do, so I did it my own way. Construction Tips: The top of the sleeve caps have 1/4″ elastic pulled through a narrow casing. A long narrow bodkin was very useful. And for the gathers, I used Jane’s tip to use dental floss and a zig-zag stitch over the floss. Be sure to secure the fixed end of the floss. I put a pin in at the end and wrapped the floss around the pin in figure-8s. And then I put a pin through the remaining tail of the floss, just in case. The floss I used was quite slippery and was happy to unwind itself from my pin whenever possible. What did you particularly like or dislike about the pattern? I think this is a cute pattern, and on the right figure, it could look really nice. The elastic in the shoulder caps seem to work really well – they keep the sleeves from falling off of my shoulders and they keep the front from gapping. Fabric Used: 100% polyester from JoAnn Fabrics in their Value section. It has a nice soft drape and was very easy to work with. Pattern alterations or any design changes you made: I made a small bust adjustment, eliminating the dart. 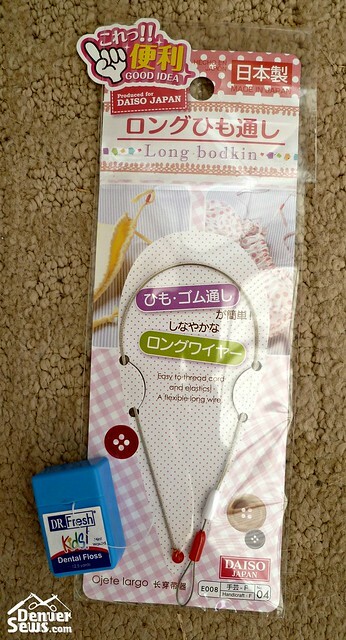 Next time, I will definitely lengthen the bodice by 1.5″ – 2″. The waist is sitting much too high on me right now. Would you sew it again? Would you recommend it to others? I may make this top again with the modification mentioned above. 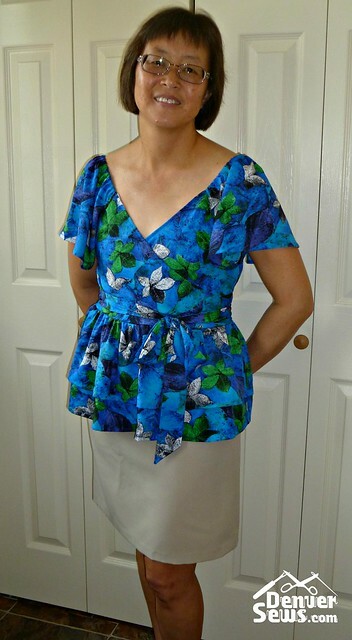 It may not be the most flattering garment for my body shape, but I enjoyed making it and it is nice and cool for summer. I certainly would encourage others to give it a try. Just beware that the waist may sit a little high. Conclusion: This top was not terribly difficult to sew (especially with the right tools and some dental floss) and I was pleasantly surprised by how well the sleeves and the elastic kept the sleeves from falling off of my shoulders and the front from gapping. Overall, I think this top would be really cute on the right body shape. Yes I did, just as instructed! Cute top, Lynne. It seems to fit really well too. I think the elastic placement made the top lay really nicely, so McCall’s had a good idea there. 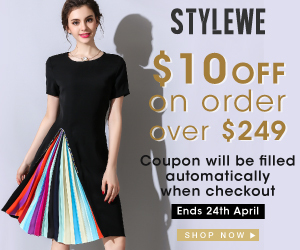 The model on the pattern cover looks extremely tall, maybe that’s why your top looks different to you.